A showpiece for your foyer, office, or man cave. The powder coated, aluminum construction gave us the freedom to create an heirloom that is unique with both a tactical feel and the presence of a high end architectural piece. Looks as good with your favorite assault rifle on it as it does with a vase of flowers. This is one very cool coffee table. We have a black table in stock. The bare aluminum version is a custom order, please allow 4-6 weeks for delivery. 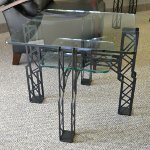 We also provide custom options such as company logos etched in the glass or the table powder coated with your company colors. Call 1-800-722-7987 for more information. For more detailed information about the Montie Gear Coffee Table, check out the Description tab below! The Montie Gear end tables are water jet cut from a single sheet of aluminum for strength, hand finished, and hand assembled for that museum quality look. This table is 24" long, 24" wide, and 22" tall. 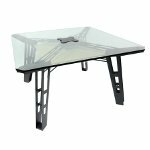 Because the materials used in the table are glass, aluminum, and stainless steel, this table does well indoors or outdoors. Finish off your room or man cave in a very sophisticated way with our line of tables. The entire line of tables coordinate so you can mix or match as needed. Available options include custom colors, bare aluminum finish, and custom sizes. Email montie@montie.com for more information. For more detailed information about the Montie Gear End Table, check out the Description tab below! 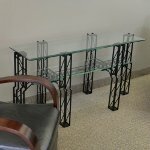 The Montie Gear tables are water jet cut from a single sheet of aluminum for strength, hand finished, and hand assembled for that museum quality look. This table is 54" long, 18" wide, and 28.5" tall. Because the materials used in the table are glass, aluminum, and stainless steel, this table does well indoors or outdoors. For more detailed information about the Montie Gear Sofa / Buffet Table, check out the Description tab below! The Montie Gear end tables are water jet cut from a single sheet of aluminum for strength, hand finished, and hand assembled for that museum quality look. This table is 30" long, 18" wide, and 23-5/8" tall. 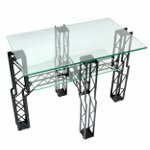 Because the materials used in the table are glass, aluminum, and stainless steel, this table does well indoors or outdoors. For more detailed information about the Montie Gear End Table Tall, check out the Description tab below!